Unlike Algeria, I actually do have some experience/memories with Slovenia. The Slovenians actually made it to Korea/Japan 2002 although their stay was short and forgettable. Still, this time around the Slovenians are pitted against my home country--USA, and they deserve another look. Korea/Japan 2002 was the only instance in which Slovenia made it to the World Cup. They were also surprise qualifiers for the 2000 Euro. The Slovenia FA is relatively young, having sprouted from the breakup of Yugoslavia early in the 1990s. 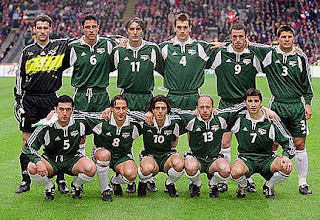 In 2002, they were pitted against Spain, South Africa and Paraguay. Their opening game against Spain was almost a total blowout until they scored late in the second half and fell by 3-1. In their next game, they faced South Africa and fell by the minimum of 1-0. In perhaps their most interesting match, the Slovenians went ahead against Paraguay before the South Americans roared back with three unanswered scores in the second half. At the same time, South Africa was falling to Spain by 3-2. This mix of scores ensured that Chilavert's team would pass on to the round of 16 on goal differential, as they were tied with South Africa in points. What's next for Slovenia? The US, England and Algeria. Considering the fact that they eliminated mighty Russia in the Uefa playoffs, it is conceivable that they have the material to handle US and Algeria, with England being a less likely source of points.